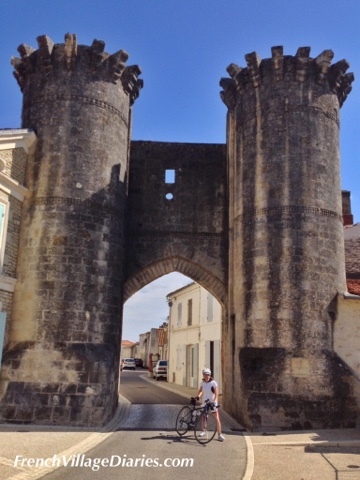 Last week we spent two days cycling in the Charente-Maritime, covering about 50 km each day, staying inland and away from the crowds at the coast. 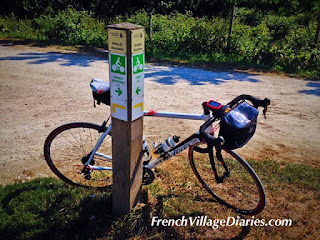 The first day was a meandering path that took us from Tonnay-Boutonne to Saint Jean d’Angely, roughly following the river Boutonne and crisscrossing the marked cycle path of the Rives de Boutonne, which we unfortunately knew nothing about when planning our route. 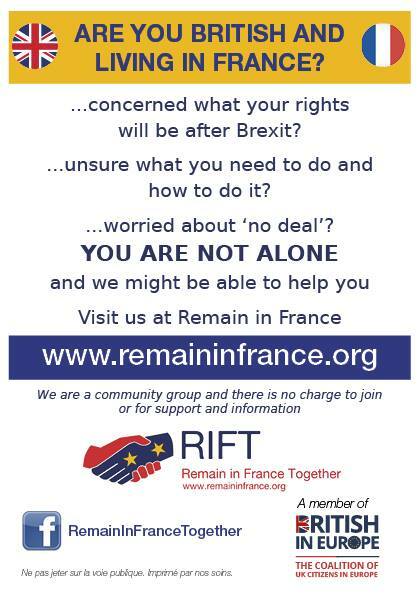 I have tried to find some information online, however I’m still not much wiser so may have to visit a local tourist information office and hope they have a map. Tonnay Boutonne is home to a very impressive medieval gateway, La Porte Saint-Pierre that we had never seen before as the town has a bypass that keeps it’s secrets well hidden from view. That is one of the great things about cycling, even in an area we think we know, it never ceases to amaze us how much more you see when you are out and about on a bike. Our route took us off the roads and onto the tracks following the river and although it was a bit lumpy and bumpy it was so peaceful it felt like we had France to ourselves. As we stopped by a bridge in the middle of fields of sunflowers and mown hay we looked up to watch about twenty black and white storks silently circling in the thermals above us. The more we watched the more we saw and although we have seen these majestic birds before in the coastal marshes of the Charente-Maritime it was a lovely surprise to see them so far inland. Our beer stop was in Saint Jean d’Angely, a town big enough to give us a choice of cafés open and ready to serve thirsty cyclists. It seemed that towers, turrets and gateways were dotted all over our route, just waiting for us to turn up and take their picture, including this very impressive turreted Romanesque church in Écoyeux, which is on the pilgrimage route to Santiago de Compostela in Spain. 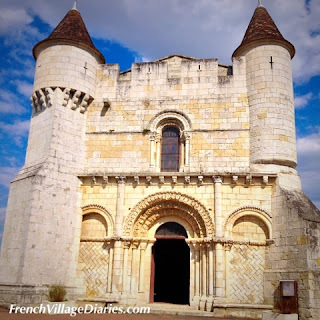 We see many fine examples of Romanesque churches around the Poitou-Charentes, but this one with the addition of it’s 15th Century fortifications was quite unusual. Our back road ride from Écoyeux to Saintes was quiet, passed through small, flowery villages and brought us into Saintes along the Charente River. This was much prettier than arriving by road and we didn’t have the hassle of finding somewhere to park. 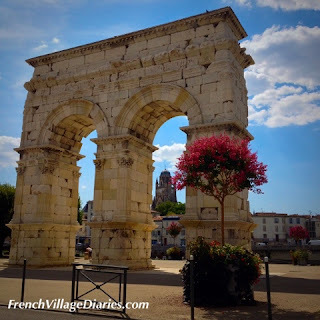 On the banks of the river we not only found a shady bar for a beer, we also got a great view of the Arc de Germanicus, a monumental gateway on the Via Agrippa, a Roman route that linked Saintes with Lyon in the east of France. It is a great privilege to live somewhere where history is available to see and experience every day and although we didn’t visit this time Saintes is also home to a Gallo-Roman Amphitheatre. This picture really says summer in France to me – it is colourful, fun and another example of street art for the people that France does so well. 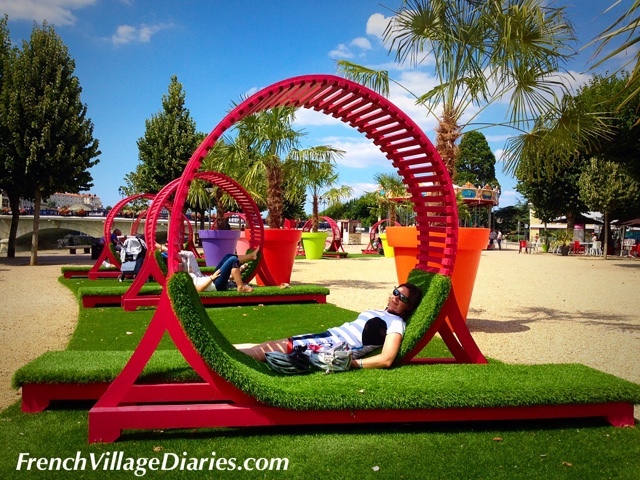 I just wish I could have one of these in our garden. The Astroturf was surprisingly soft and comfortable and the backrest was just the perfect angle for me. It was very hard to get up and carry on cycling. We are looking forward to more cycling fun this summer, including around La Rochelle. 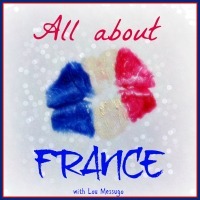 This blog has been linked to The Lou Messugo All About France blog link. 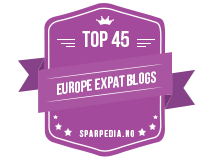 To read more click here.